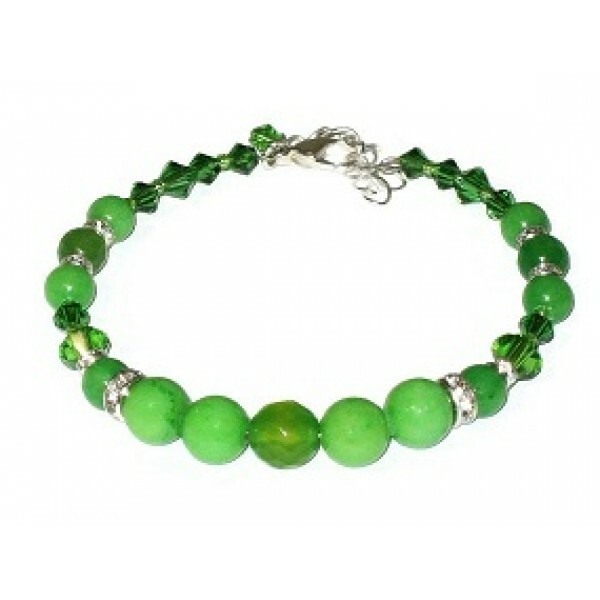 This green jade, agate and Swarovski crystal bracelet can be the finishing touch for your special occasion look. It is finished with a silver-plated lobster clasp and is made on expandable wire and can be extended from 6 1/2 to 7 1/2 inches when using its silvertone extender. These green earrings consist of jade round beads, Swarovski crystals, freshwater pearls .. These earrings consist of a mixture of kelly green freshwater pearls, peridot colored heart-sh.. This necklace is made up of a blend of lime, apple and kelly green. It features a mother-of-p..
Add a little pop of color to your wardrobe with these lime green mother-of-pearl and faceted a.. This green faceted jade ring is wrapped in silver-plated non-tarnish wire. The ring size is 7..